Warning: this recipe is dangerous. Not only is it one heck of a crowd-pleaser, but your family and friends will be kicking down your front door for a seat at your dinner table. Heed my words. 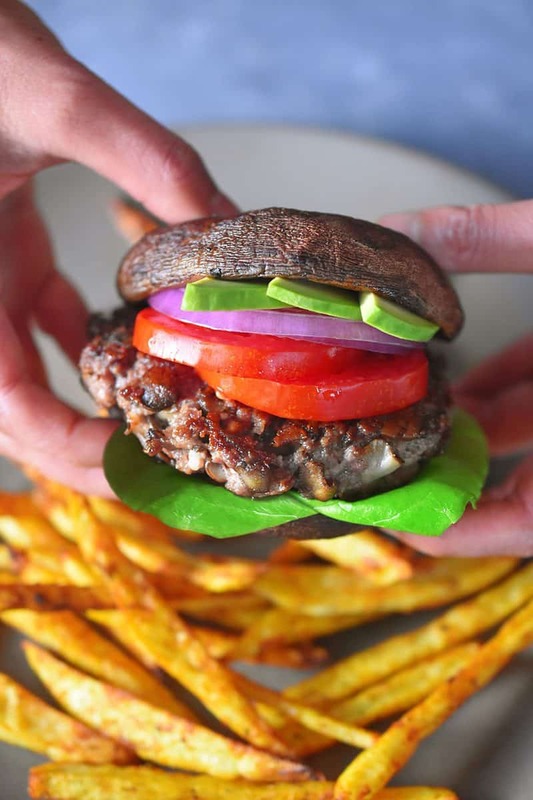 Originally featured in our cooking app (and later, in our first cookbook, Nom Nom Paleo: Food for Humans), this is a burger recipe that heaps umami on top of umami. 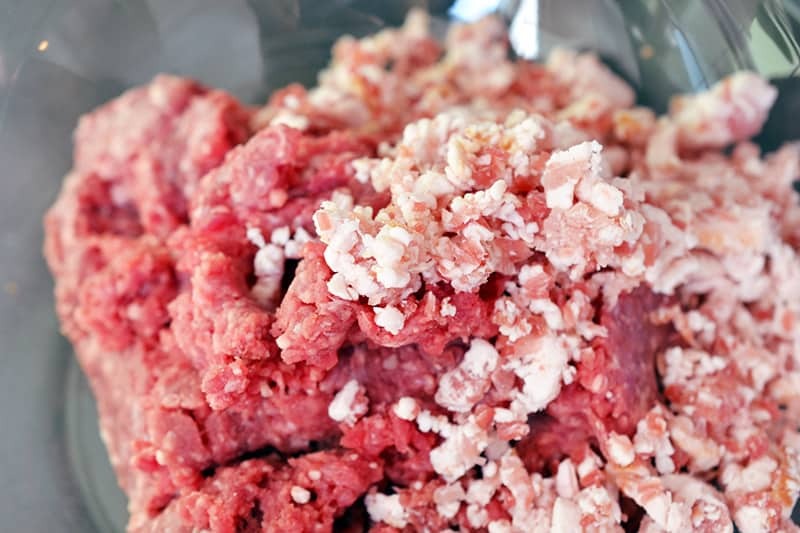 These days, more and more restaurants and food pros are grinding bacon with beef to form their special burger blends, but like many of you, I don’t have a meat grinder on hand in my kitchen. My solution? 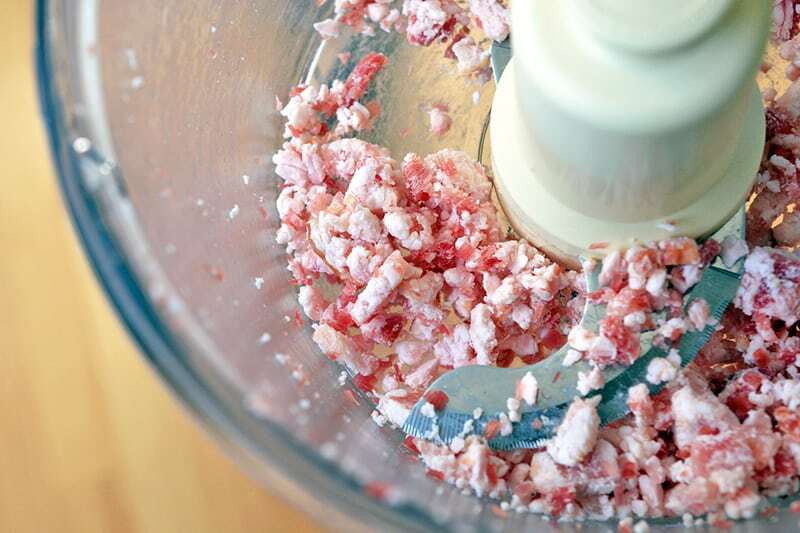 Freeze the bacon, roughly chop it, and then pulse it in your food processor before mixing it with ground beef. (Remember to use sugar-free bacon to keep it Whole30-friendly!) 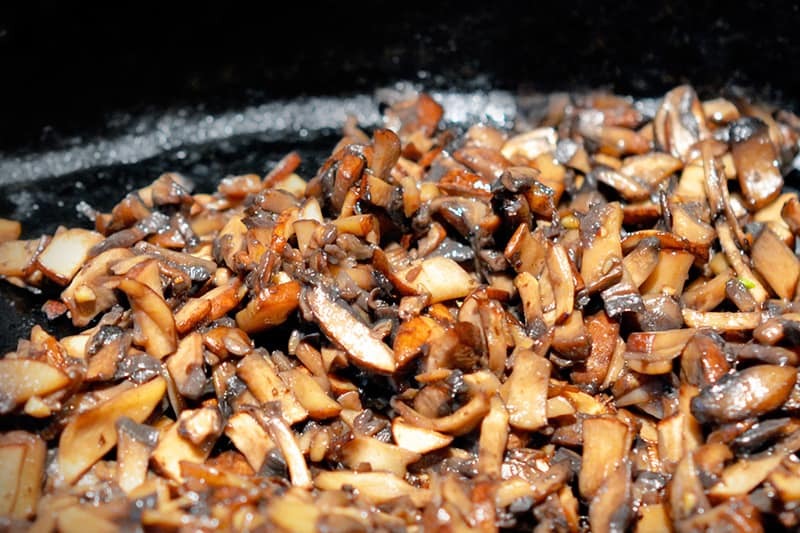 Plus, I add cooked-and-cooled minced mushrooms for an extra blast of flavor power. 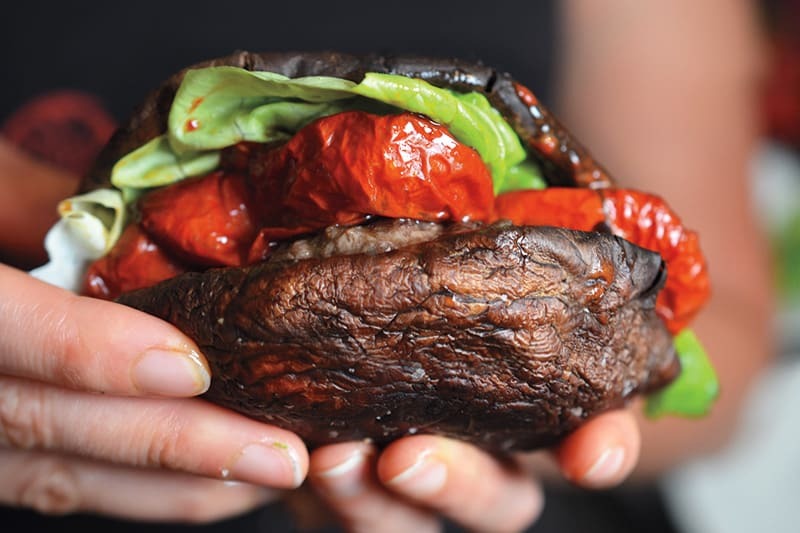 …but if you have time, I highly recommend roasting Portobello mushroom caps and using them as “buns.” And don’t forget to load up the toppings! Heat 1 tablespoon of ghee in a cast-iron skillet over medium heat, and sauté the mushrooms until the liquid they released has cooked off. 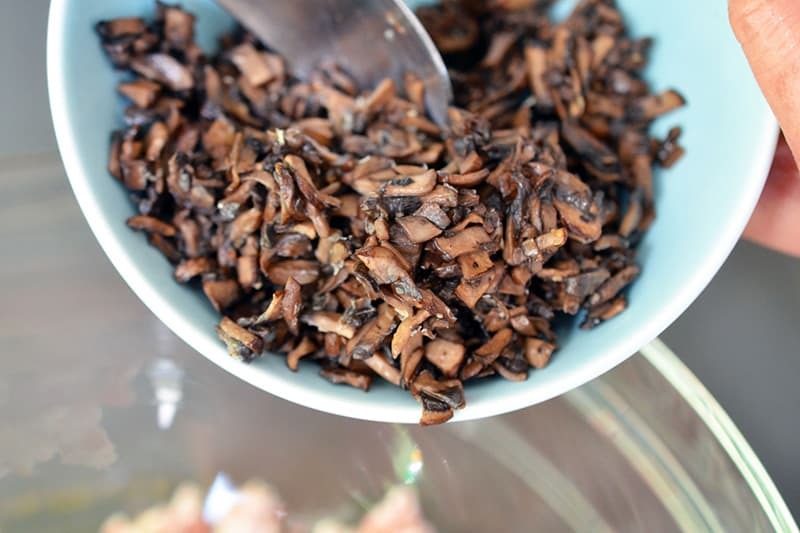 Set aside the cooked mushrooms to cool to room temperature. 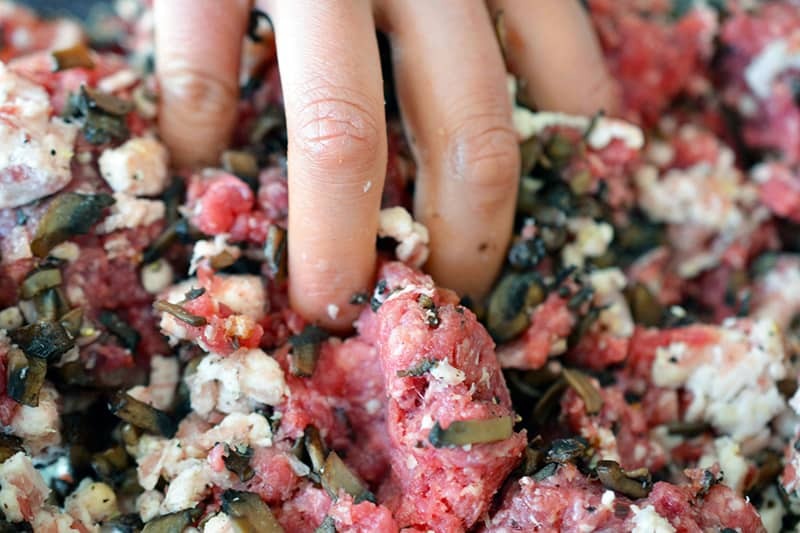 Pulse the frozen bacon pieces in the food processor to the consistency of ground meat. Just a few pushes should do it! In a large bowl, combine the ground beef, bacon, and mushrooms, and season with salt and pepper. Using your hands, gently combine the ingredients. Be careful not to overwork the meat! 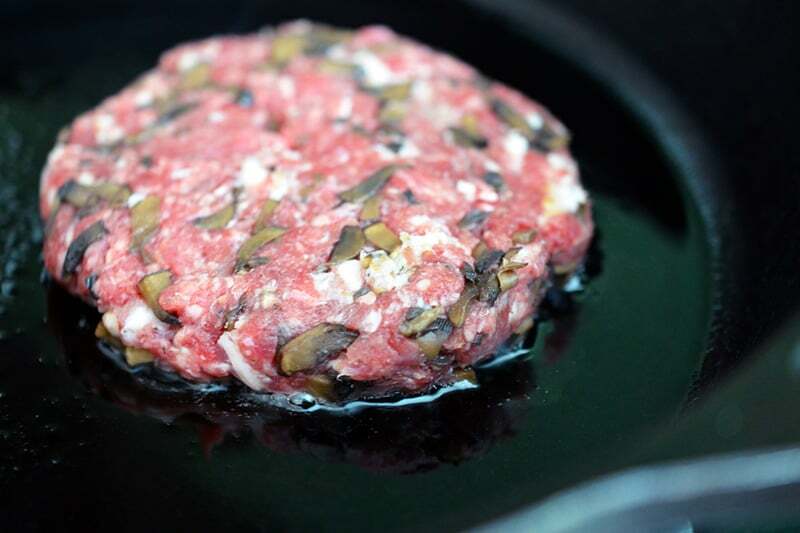 Divide the mixture into four portions (or more if you’re making sliders), and use your hands to flatten each into ¾-inch-thick patties. 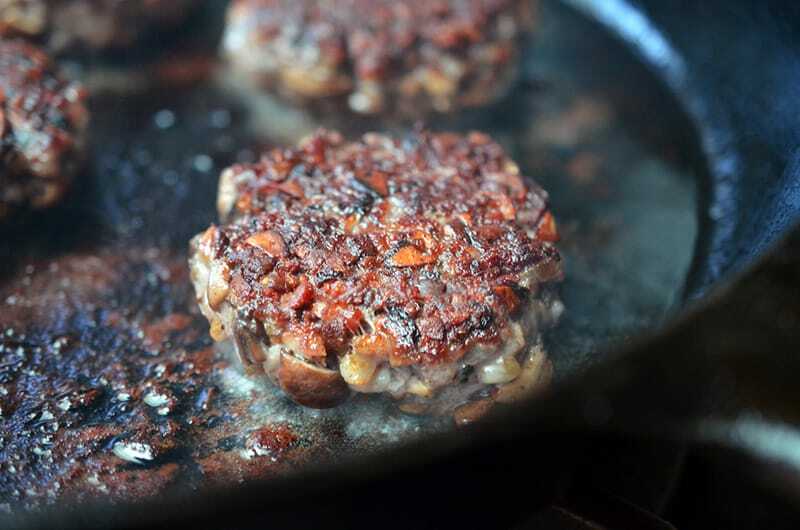 Melt the remaining tablespoon of ghee in a cast iron skillet over medium heat, and carefully add the patties. Fry up the patties in the hot fat, turning once. They should take about 3 minutes per side, whereas sliders should only take about 2 minutes per side. Of course, you are free to cook ’em as well-done as you wish. Transfer the patties to a wire rack so that any excess fat can drain off. 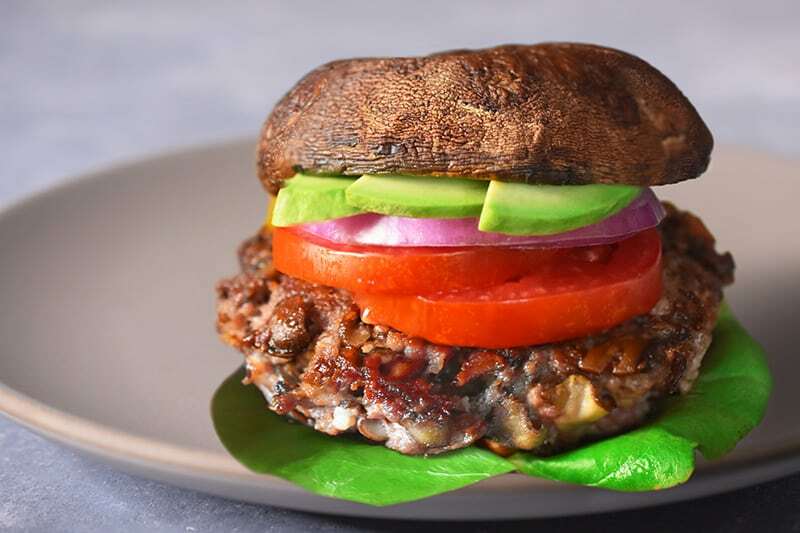 Pile them with your favorite burger toppings, wrap them in lettuce leaves or roasted Portobello mushrooms, and chow down! 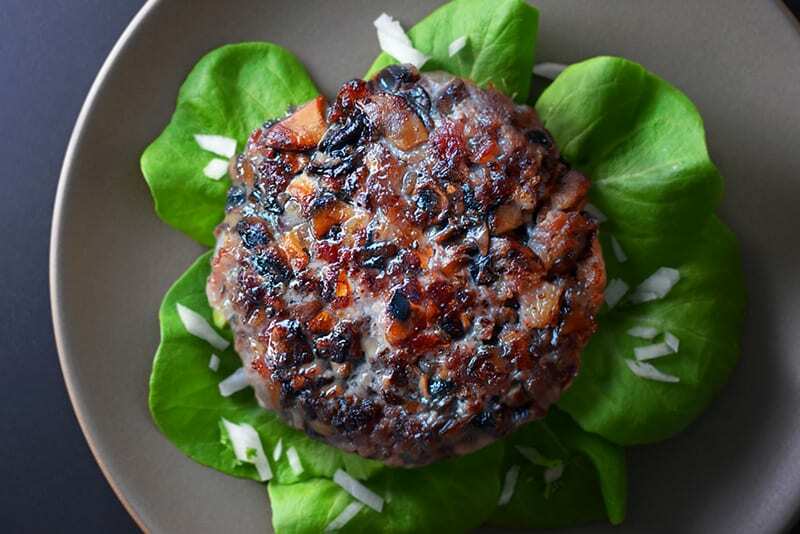 This umami-packed crowd-pleasing burger combines ground beef, bacon, and sautéed mushrooms! It's Whole30-friendly, too, if you use sugar-free bacon! 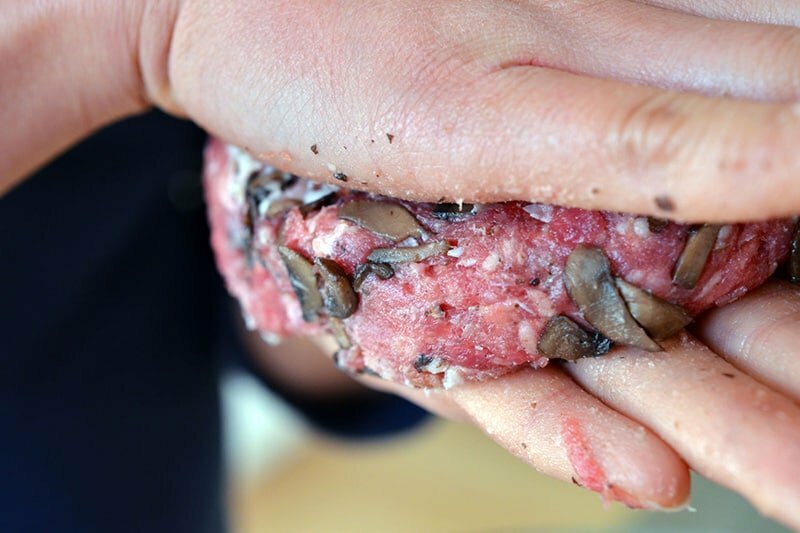 In a large bowl, combine the ground beef, bacon, and mushrooms, and season with salt and pepper. Using your hands, gently combine the ingredients. Be careful not to overwork the meat! Melt the remaining tablespoon of ghee in a cast iron skillet over medium heat, and fry up the patties in the hot fat, turning once. They should take about 3 minutes per side, whereas sliders should only take about 2 minutes per side. Of course, you are free to cook ’em as well-done as you wish. 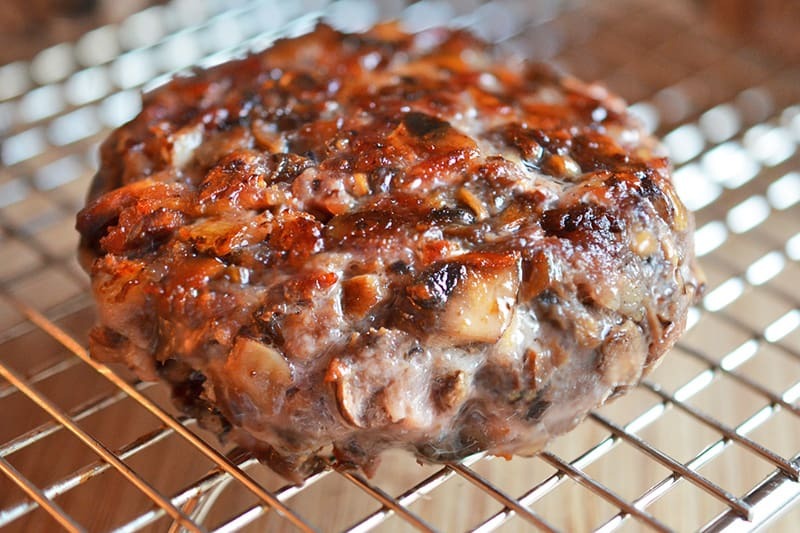 Transfer the patties to a wire rack so that any excess fat can drain off. Pile them with your favorite burger toppings, wrap them in lettuce leaves or roasted Portobello mushrooms, and chow down!